President Mahinda Rajapaksa promised the nation that he will not allow anyone to mortgage the Motherland or auction it under any circumstances.Addressing the gathering at the handing over of land deeds ceremony Ranbima at Temple Trees yesterday, President Rajapaksa said promises given under the Mahinda Chintana were being achieved one by one uninterrupted. "People had lost their hopes, interest and trust in politicians who had promised to fulfid their dreams, specially the youth. Political promises during the election campaigns were empty pledges. But we have promised what we can achieve. 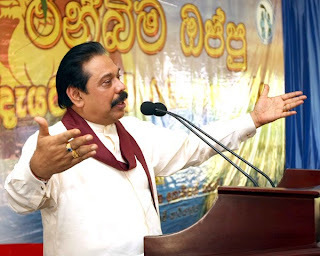 We are using the Mahinda Chintana practically and it is being achieved one by one," he added. "People today do not accept false promises. Now you can't forget pledges. People will not allow that," he said. President Rajapaksa said the Government had fulfilled many promises. The Norochcholai coal power plant, Ihala Kotmale projects, flyover bridges, Kerawalapitiya power plant and many other road development programs are in the process and many have already been built. These development programs have made the lives of people easy," he added.